This study aims to conduct an audit and evaluation of the Pamekasan District e-Government Dispute Settlement services on EDM and APO Domains. The method used is the COBIT Framework.5, a framework for measuring information system governance maturity issued by ISACA in 2012. The audit was conducted at the Pamekasan District Dispendukcapil Office and took samples of e-Government Services in 4 Districts and 12 Districts considered quite representative to be audited.The results showed that overall the results of the audit capability level of ICT services at Pamekasan district Dispendukcapil were at level 3 (Establish) with capability level index values in establish and 2.O (established) EDM domains. Field findings show that business processes in ICT management of e-government services at the sub-district, village levels show that they are at level 0 (incomplete), which means that there is almost no process of governance of ICT services at that level. Suggestions and recommendations that can be made are more authority is needed at the sub-district and village level by adding competent human resources in the ICT field to provide better e-Government services. C. Paper, D. Napitupulu, and U. B. Luhur, “Kajian Faktor Sukses Sistem Layanan Berbasis Elektronik ( E-Services ) di Lembaga Pemerintah Kajian Faktor Sukses Sistem Layanan Berbasis Elektronik,” no. August, 2017. C. Paper, D. Napitupulu, A. Febri, A. Lembaga, and I. Pengetahuan, “ANALISA KUALITAS WEBSITE INTRA LIPI BERBASIS PENDEKATAN WEBQUAL DAN IMPORTANCE PERFORMANCE ANALYSIS: STUDI KASUS DI SATKER X,” no. August, 2016. F. Masyhur, “IMPLEMENTASI STRATEGI E-GOVERNMENT KOTA PAREPARE MENGGUNAKAN MODEL CASSIDY DAN DIMENSI PEMERINGKATAN E-GOVERNMENT INDONESIA (PeGI),” J. Penelit. Komun. dan Opini Publik, vol. 20, no. 2, pp. 111–122, 2016. N. Karniawati and R. Rahmadani, “ANALISIS KEBIJAKAN PENERAPAN E-GOVERNMENT MELALUI SISTEM INFORMASI MANAJEMEN KEPEGAWAIAN (SIMPEG) (SUATU STUDI PADA BIRO KEPEGAWAIAN SEKRETARIAT DAERAH PROVINSI JAWA BARAT),” Maj. Ilm. UNIKOM Vol.7, vol. 7, no. 2, pp. 233–248, 2017. T. Muryanti, M. Pinilih, and D. Oktaviana, “EVALUASI SISTEM INFORMASI MANAJEMEN RUMAH SAKIT ( SIMRS ) PADA RSIA BUNDA ARIF PURWOKERTO MENGGUNAKAN FRAMEWORK COBIT 5,” vol. 11, no. 2, pp. 59–75, 2018. S. F. S. G, “The Critical Success Factors Model for e-Government Implementation in Indonesia,” 2017 Fifth Int. Conf. Inf. Commun. Technol., vol. 0, no. c, pp. 0–4, 2017. Z. Alreemy, V. Chang, R. Walters, and G. Wills, “International Journal of Information Management Critical success factors ( CSFs ) for information technology governance ( ITG ),” Int. J. Inf. Manage., vol. 36, no. 6, pp. 907–916, 2016. F. A. Anza, D. I. Sensuse, and A. Ramadhan, “Developing E-Government Maturity Framework Based on COBIT 5 and Implementing in City Level : Case Study Depok City and South Tangerang City,” Proceeding EECSI, no. September, pp. 19–21, 2017. H. M. Astuti, F. A. Muqtadiroh, E. Wahyu, and T. Darmaningrat, “ScienceDirect Risks Assessment of Information Technology Processes Based on COBIT 5 Framework : A Case Study of ITS Service Desk,” Procedia Comput. Sci., vol. 124, pp. 569–576, 2018. G. Sabatini, “Information Technology Governance Assessment in Universitas Atma Jaya Yogyakarta using COBIT 5 Framework,” Proceeding EECSI, no. September, pp. 19–21, 2017. M. A. Putri, I. Aknuranda, and W. F. Mahmudy, “Maturity Evaluation of Information Technology Governance in PT DEF Using Cobit 5 Framework,” J. Inf. Technol. Comput. Sci., vol. 2, no. 1, pp. 19–27, 2017. F. A. Anza, D. I. Sensuse, and A. Ramadhan, “Developing E-Government Maturity Framework Based on COBIT 5 and Implementing in City Level : Case Study Depok City and South Tangerang City,” Proc. EECSI, no. September, pp. 19–21, 2017. Y. Muflihah and T. D. Susanto, “FAKTOR YANG MEMPENGARUHI WARGA DAN PEMERINTAH DALAM ADOPSI E-GOVERNMENT : SEBUAH ULASAN SISTEMATIS,” J. Teknol. Inf. dan Ilmu Komput., vol. 4, no. 4, pp. 304–310, 2017. F. Palijama, “Developing Modified PeGI Indicators for e-Government Ranking Method,” Int. Conf. Inf. Technol. Inf. Syst. Electr. Eng. (ICITISEE), Yogyakarta, Indonesia., vol. 1, no. 1, pp. 169–173, 2016. N. Z. Firdaus, “Evaluasi Manajemen Risiko Teknologi Informasi Menggunakan COBIT 5 IT Risk ( Studi Kasus : PT . Petrokimia Gresik ),” J. Pengemb. Teknol. Inf. dan Ilmu Komput., vol. 2, no. 1, pp. 91–100, 2018. R. G. Mufti and Y. T. Mursityo, “Evaluasi Tata Kelola Sistem Keamanan Teknologi Informasi Menggunakan Framework COBIT 5 Fokus Proses APO13 dan DSS05 ( Studi Pada PT Martina Berto Tbk ),” J. Pengemb. Teknol. Inf. dan Ilmu Komput., vol. 1, no. 12, pp. 1622–1631, 2017. DARMAWAN, Aang Kisnu; DWIHARTO, Arisandi. Pengukuran Capability Level Kualitas Layanan E-Government Kabupaten Pamekasan Menggunakan Framework COBIT 5.0. 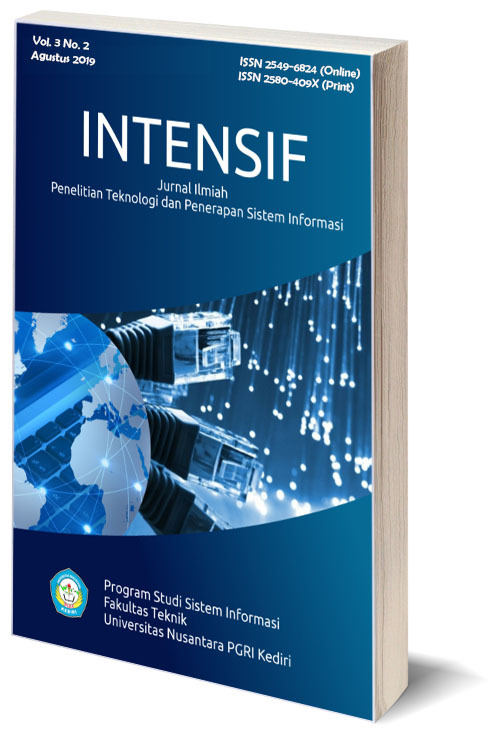 INTENSIF: Jurnal Ilmiah Penelitian dan Penerapan Teknologi Sistem Informasi, [S.l. ], v. 3, n. 2, p. 93-103, apr. 2019. ISSN 2549-6824. Available at: <http://ojs.unpkediri.ac.id/index.php/intensif/article/view/12659>. Date accessed: 25 apr. 2019. doi: https://doi.org/10.29407/intensif.v3i2.12659.